ALEJANDRO CREMADES leads the vision and execution for Onevest as its cofounder and executive chairman. The Onevest ecosystem supports founders and investors in building successful ventures. Onevest provides technology products to connect founders, investors, advisors, and influencers in the entrepreneurship community seamlessly and easily. "The Art of Startup Fundraising should be a mandatory reading for entrepreneurs that are looking to raise capital. 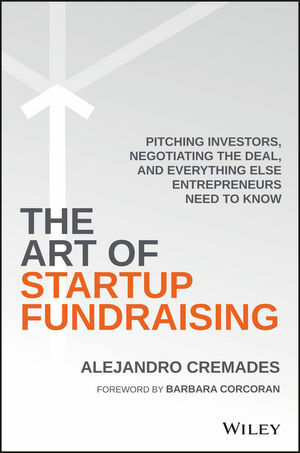 This book will enable Alejandro to help many more early stage companies answer the tough questions when fundraising." "Raising capital is often the most daunting and least understood aspects of starting a new business and there are few people more experienced than Alejandro Cremades to act as a guide. The Art of Startup Fundraising unlocks key secrets of fundraising for newly minted entrepreneurs." "This book provides a clear, concise tour of the fundraising game. With his crowdfunding and entrepreneurial expertise in full display, Cremades does a terrific job making a complicated process simple and accessible." "Fundraising can be an incredibly frustrating experience for startup founders because they are at a fundamental disadvantage: they know very little about the process, and investors know a lot. Luckily, Alejandro has taken the time to assemble a detailed blueprint of how it works behind the scenes that will help any founder level the playing field and navigate the process like a pro. If you are raising money for your startup, don't start without reading this book." "The Art of Startup Fundraising translates art into science. By sharing proven formulas, strategies, and case studies that work, Alejandro Cremades provides a needed service to future entrepreneurs." "A superb book on fundraising. Alejandro's guidance should arm entrepreneurs with the necessary tools to close with success a meaningful round of financing."